The European Space Agency's Planck space telescope was launched in 2009. 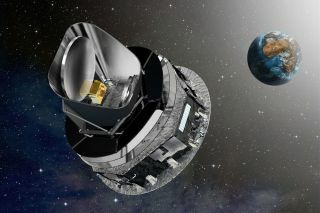 During its four-year mission, it observed variations in the cosmic microwave background across the entire sky. The first all-sky map was released in March 2013 and the second, more detailed, map was released in February 2015. The mission's successes include determining that the universe is slightly older than thought; mapping the early universe's subtle fluctuations in temperature and polarization, which eventually gave rise to the structure we see today; and confirming that 26 percent of the universe comprises dark matter. From its orbit 930,000 miles above Earth, the Planck satellite spent more than four years detecting the oldest light in the universe: the cosmic microwave background radiation. That fossil from the Big Bang fills every square inch of the sky and offers a glimpse of what the universe looked like nearly 14 billion years ago, when it was just 380,000 years old. Planck's observations of this relic radiation shed light on everything from the evolution of the universe to the nature of dark matter. On Feb. 18 from 2:30 to 3:15 p.m. EST, George Efstathiou, Clement Pryke and Paul Steinhardt will answer your questions in a Google Hangout about the earliest light in the universe, what it can tell us about the theory of inflation, and what we can expect to learn about the very early universe in the coming decade. Submit your questions ahead of, and during, the webcast by emailing info@kavlifundation.org or by using the hashtag #KavliLive on Twitter or Google+. George Efstathiou is the director of the Kavli Institute for Cosmology at the University of Cambridge and one of the leaders of the Planck mission. The Kavli Foundation recently spoke with Dr. George Efstathiou, director of the Kavli Institute for Cosmology at the University of Cambridge and one of the leaders of the Planck mission, to better understand Planck's latest results and their implications for the theory of inflation — that interview follows below. THE KAVLI FOUNDATION: In 2013 and now this year, Planck provided very strong experimental evidence supporting the theory that the universe went through a mindbogglingly rapid expansion in its very first moments. Can you elaborate on the latest findings and why they're important? George Efstathiou: Inflation — the theory that the early universe expanded incredibly rapidly in its first moments — makes a number of generic predictions. For example, the geometry of the universe should be very close to flat, and this should be reflected in fluctuations we see in the cosmic microwave background light. With the first Planck data, which we released in 2013, we verified some aspects of this model to pretty high precision by looking at the temperature of the cosmic microwave background across the sky. With the 2015 release, we improved the precision of those temperature measurements and also added accurate measurements of a twisting pattern in the cosmic microwave background called polarization. These polarization measurements are really important in telling us what the fabric of space was like in the early universe. You see, there are several possibilities. For example, in some models motivated by higher-dimensional theories such as string theory, “cosmic strings” can be produced in the early universe, and these would generate a different type of fluctuation pattern. We see no evidence for cosmic strings or other types of cosmic defect. What we found is that everything is consistent — with a very high precision — with simple inflationary models. So, for example, we now can say that the universe is spatially flat to a precision of about half a percent. That's a substantial improvement over what we knew before Planck. TKF: You've called the theory of cosmic inflation a cartoon of a theory. What did you mean by that? G.E. : We don't yet understand the fundamental physics that drove inflation, and we certainly don't understand the details of how it worked. The simplest model of inflation requires that the early universe contained what's called a scalar field. This field permeates all of space and is responsible for causing space to expand faster than the speed of light. And, as with all quantum fields, it contains quantum fluctuations. It's those tiny quantum fluctuations that, once they were stretched in size during inflation, generated the structure that we see across the Universe today — all of the galaxies and stars and planets. That's a simple model of inflation. Now, what is that field exactly? We don't know. There are many theories out there, but really they're all just guesses. That's why I called it a cartoon of a theory — because we don't understand how inflation works in any fundamental sense. What we need is better experimental data that tells us what the early universe looked like and hopefully this will point us toward a fundamental theory of inflation. The Background Imaging of Cosmic Extragalactic Polarization 2 (BICEP2) experiment, shown here in the foreground, studies the cosmic microwave background from the South Pole, where cold, dry air allows for clear observations of the sky. In March 2014, the BICEP2 team announced that they had seen evidence of gravitational waves, offering what seemed to be "smoking gun" evidence of inflation. Although a Planck-BICEP2 joint analysis has since shown that dust in the Milky Way had mimicked the signal expected from gravitational waves, future experiments may yet discover these long-sought waves. The project was funded by $2.3 million from W. M. Keck Foundation, as well as funding from the National Science Foundation, the Gordon and Betty Moore Foundation, the James and Nelly Kilroy Foundation and the Barzan Foundation. TKF: Does that mean the next steps are experimental as opposed to theoretical? G.E. : That is a very interesting question. In my mind, real progress will require experiments, because the very early universe involves energy scales so much higher than anything we've been able to test in laboratory experiments here on Earth. When you make such a very big leap, you don't really know what things look like. That leaves open lots and lots of possibilities. For example, the extra dimensions predicted by string theory are hidden from us — so we don't experience them. They must be very small and "compactified" in some way — but how, we don't know. So from the theory point of view, there are just too many options right now. Also, in cosmology, we're talking about highly dynamic situations. Everything is changing very rapidly and that's also difficult to analyze theoretically. There's always the possibility that some tremendous new theoretical insight will narrow down the options. But I think that we need to do experiments — if we can — that narrow down the options experimentally. If we detected gravitational waves — ripples in the curvature of space-time — that measurement would narrow down the options a lot. It would tell us the energy scale of inflation. What's more, any detectable level of gravitational waves would establish an empirical link with quantum gravity. Quantum gravity, which would align the force of gravity with the principles of quantum mechanics, is a very important experimental target, one that is possible to reach with high precision experiments. I think that would be the most likely experimental development that could actually make contact with physics at the very high energy scales of the early universe. TKF: One of the most publicized new revelations from Planck is evidence the first stars in the universe started to shine about 550 million years after the Big Bang — which means they are younger by about 100 million years than previously thought. How could we have gotten this so wrong? G.E. : You know, I'm not so keen on claiming this as a great scientific achievement by Planck — but it is interesting. To explain why, I need to give you a little background. At the end of inflation, we know that the universe became very, very hot. Since then, as the universe expanded, it cooled down. And when the universe was 400,000 years old, the temperature was low enough that electrons and protons could combine to form neutral hydrogen. So at that time, the universe was neutral and pretty uniform. We can see quasars — very bright compact regions at the centers of distant galaxies — that existed back when the universe was about 840 million years old. That's really very young compared to its 13.8 billion years today. Back then, if the universe had been filled with neutral hydrogen, that hydrogen would have absorbed quasar light at short wavelengths and we wouldn't be able to see it in our measurements today. So because we can see this light from these quasars, we know that when the universe was 840 million years old, it was no longer neutral. Sometime between the Universe being 400,000 years old and 840 million years old, energy must have been injected into the gas to change this. So the question is, where did that energy come from? Well, it must be that stars formed and started to release energy. Now, looking at the deepest images from the Hubble Space Telescope , we can see some of these very early stars. But from the stars we see, it wouldn't be possible to release enough energy to ionize the hydrogen by the time the universe was 420 million years old — as was suggested by previous measurements of the cosmic microwave background made with the Wilkinson Microwave Anisotrophy Probe — or WMAP — satellite. Now, with the Planck measurements, we're saying that it happened a bit later, at 560 million years. That difference of about 140 million years may not sound like a lot, but it now brings all of our observations into alignment. This is a very, very difficult measurement to make — it's a very small signal hidden behind a lot of contamination from our own Milky Way. You have to dig out the real signal from all this noise. With Planck, we were for the first time able to make this measurement using the Planck data in two different ways. Why I'm not so keen on it as a real highlight from Planck is that there's absolutely nothing wrong with the previous measurements. The WMAP observations are perfectly fine, but if you take their maps, and correct for contamination by the Milky Way, then you get the same answers as the Planck results. So everything is consistent in the end. This map, captured by ESA's Planck space telescope, reveals the Milky Way galaxy. Gas appears in yellow, radiation in blue and green, and several types of dust are shown in red. TKF: The Planck results are also helping us understand dark matter — the mysterious substance that makes up 20 percent of the universe yet has yet to be well understood. What exactly have we learned about dark matter from Planck? G.E. : What do we know? Really, we're still a long way from understanding dark matter. The leading candidate is a type of particle predicted by supersymmetry. That theory predicts a partner particle for each particle that we already know. But if that theory is true, supersymmetric particles should appear in collisions at the Large Hadron Collider. So far, they haven't. So dark matter is still unknown. Planck has detected no signal of dark matter. Supersymmetry predicts that dark matter particles should occasionally interact with other dark matter particles and produce a flash of energy — a process called annihilation. But we don't see it. That's really not all that surprising. It's easy to hide. So that's something that future cosmic microwave background experiments might be able to see. But we haven't seen any signs of annihilating dark matter from Planck. We have looked also very carefully at neutrinos — tiny, ubiquitous particles we know come in three types. As far as well can tell, there are no other types of neutrinos that could help account for some of the dark matter. People are also still trying to determine the mass of these three neutrinos. We know from other experiments the least mass that these three particles could have. Planck has now set a limit on the most mass that they could possibly have. We're narrowing down the options, and will hopefully soon learn their exact mass. Neutrinos are some of the most mysterious particles in the universe, so this would be an important step toward understanding them. Some theorists have also suggested that dark matter and dark energy could interact in some way. As far as we can tell, dark energy is completely constant — so there's no evidence that it interacts with dark matter. TKF: We would be remiss if we didn't talk a bit more about gravitational waves. Last March, another experimental team called BICEP2 announced that they had seen evidence of gravitational waves in their observations of the very early universe. Then, just a few weeks ago, joint analysis of that data carried out by members of both Planck and BICEP2 revealed that unidentified gas and dust had contaminated the data, and that gravitational waves remain undiscovered. What does this mean for future hopes of discovering gravitational waves? G.E. : When the BICEP2 team announced their result, I was really shocked. The signal they detected was really big. We had already done an analysis based on the Planck 2013 data, and we had set a limit on how big the signal could be. And BICEP2's measurements were about twice as big as that. So if BICEP2 really had detected gravitational waves, there would need to be some really strange and unexpected physics at work for us to get such different results. The BICEP2 group knows what it's doing — these guys are as good as any group in the world. And they've been working on various versions of this experiment for 7 or 8 years. So from the experimental side, the data is beautiful. They clearly detected something. That something could have been gravitational waves, or it could have been intervening dust that confused their data. The BICEP2 experiment looks at a very small field of view, and Planck's signal to noise is not very big. So we arranged to collaborate. Essentially, we improved the signal to noise on dust by cross-correlating their maps with ours. That showed that, as of yet, we still have no statistically significant evidence of gravitational waves. That resolves the conflict with the original Planck results. And, in the big picture, that's a good thing. No really strange physics is needed to reconcile the two experiments. So now we're in a situation where we have a limit on the size of a gravitational wave signal, and that number is consistent with the Planck results. It doesn't rule out gravitational waves by any means. If you look at the joint analysis, you see that there's plenty of room for gravitational waves to be lurking there, just below the level we've set by combining the BICEP2 and Planck data. If that's true, it shouldn't take a very long time to dig it out. So there could be a very important development coming.